The Sustainable Energy Research Group (SERG) is part of the Energy and Climate Change Division (ECCD) within the Faculty of Engineering and the Environment at the University of Southampton. The Sustainable Energy Research Group (SERG) aims to promote and undertake fundamental and applied research related to the efficient use of energy in the built environment. This is alongside pre-industrial development in the areas of renewable energy technologies. 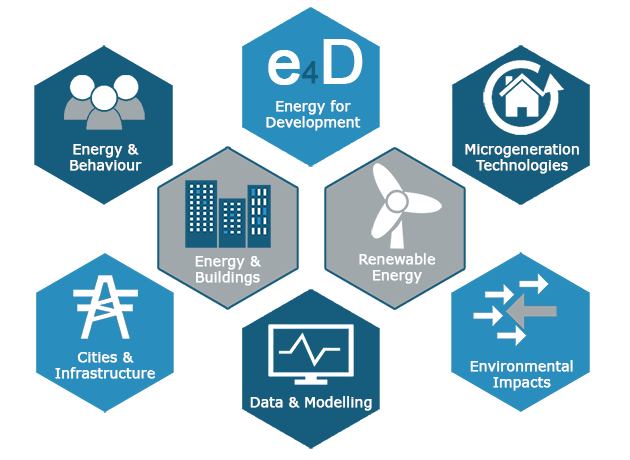 SERG undertakes research in core areas of energy, specifically in Cities and Infrastructure, Energy for Development, Data and Modelling, Energy and Behaviour, Energy and Buildings, Environmental Impacts, Microgeneration Technologies and Renewable Energy (Solar Photovoltaics and Marine Energy). For more information about data in cities, please visit: MyData Portal. For more information about any of these core areas of research, please click on the links above or click on a specific area of research below. Please click on the logos for more information on the Sustainable Energy Research Group’s (SERG) current projects. Please click on any of the upcoming events and news stories below for more information.